De-clutter, De-stress. | Wiggle Room | Organization for Busy Moms!Wiggle Room | Organization for Busy Moms! Wiggle Room | Organization for Busy Moms! Organization for Busy Moms! We believe an organized home is a less stressful home. 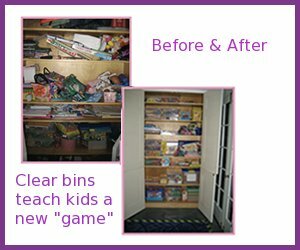 Wiggle Room cuts through the clutter, organizes those overwhelming toy rooms, kids closets or kitchens so you can breathe easier. Give Wiggle Room a call today, and we’ll give you a no-cost, no-obligation, face-to-face assessment of how we can help you deal with whatever problem area has you pulling your hair out! What sets Wiggle Room apart? We create educational play-spaces, and put in place home systems that work equally well for Mom and child alike. Knowing the mind of a busy Mom through past experience in education & working directly in the home with both Moms & children. Tax Time: Let’s Get Organized! I absolutely love the play room! We work with the boys every night to clean up their play room and it is so easy because everything just gets dumped into a clearly labeled bin. I love going to bed with a clean(er) house and waking up without having to see the eyesore that we used to have. Many nights we would not bother having the boys clean up because it was such a pain. I often did it myself because it was so much faster. After the reorganization we can all get the room put back together in 5 minutes. Thank you so much! © 2019 Wiggle Room | Organization for Busy Moms!. All Rights Reserved.